Bye Udemy, Hello MemberMouse! – Taking My Site to The Next Level! What the heck has taken me so long to sell products from my own site? Honestly, it was FEAR — which created massive amounts of indecision, analysis paralysis and procrastination! The idea of being completely responsible for the orders, payments, etc. really did intimidate the crap out of me, but I’ve chosen a plugin (MemberMouse) that helped eliminate that fear because of the amazing support they offer in that area. Yes, there are more cost-friendly options out there (even free ones), but support and continued product enhancements were the two most important factors in my decision. So now that I’m over that fear and extreme indecision, I’m ready to move forward! This is going to sound cheesy, but I feel like teaching is something I was put here to do. I can’t tell you how much I enjoy helping people learn and making videos. I’m excited to finally sell on a platform that I actually own. I’ve Been Recording Like Mad! I’m working on courses related to blogging, video and just finished my course on Camtasia. I’m so excited for you to learn it in a quick and non-intimidating way. I’m even going to teach neat tricks such as animation. Did you notice how I animated my logo at the beginning of my last video? (Play the start of the video below.) That was done in Camtasia! Camtasia is so much more than just screen recording software. Sometimes I edit talking head videos in the software too. I’m going to catch you up on the latest happenings with Udemy. There are some big, big changes coming down the pike. If you’re thinking of selling on the platform, you can’t miss this! A lot of people are upset, but overall, it’s going to be best for Udemy and instructors down the road. Nevertheless, I’m glad I’m making the move to go self-hosted with my courses. Why I chose MemberMouse over more popular and less costly plugins like WishListMember, S2Member, etc. Earning With Udemy and Your Free Course on Creating Animated Video Presentations! I’ve been using wp-client it on one site, and it seems fairly comprehensive (not sure about how deep in specific areas compared to these others though). I’m considering adding MemberMouse to my SeoWritingTips, but I’d *love* to know what you (or others) think about it before going in that direction. You mentioned that there are a lot of great reviews on member mouse, and later in the pod cast you mentioned that they have an affiliate program. Do you think that many of the positive reviews may be for this reason? I come across many products that offer affiliate programs and this can make it difficult to determine if the product is actually good or if people simply give it a great review to entice you to join so that they get a commission payment. That’s always something to watch out for, BUT some of these other ones have great affiliate programs that pay even MORE than MM and yet there are still a lot of bad reviews. The other thing to consider here is that MM is not nearly as popular as some of the others. So it could be that there are more bad reviews for the others simply because they are more popular. Great job lisa, it is really cool decision, it would always be in a non-comfort zone when we are under some guidance, when we are own boss, then it would be pleasant and can feel the work, rather think of completing the work. I am delighted with your writing. Great podcast, and its true to have control on prices. Love your blog always, keep posting. I didn’t know about MemberMouse before and now I am going to have a try for sure. Thanks for sharing such great information with us and also thanks for the podcast. Thank you! Yep I agree. I’ve been online a long time and I’ve never actually controlled my own destiny with products. It’s always been Clickbank, Udemy, etc. so I’m looking forward to finally hosting my own products. It’s going to be a journey and I’m sure met with challenges along the way but worth the work in the long run. What’s your niche by the way? And what plugin/platform are you going to use to sell your courses? I like to follow people who are on the same journey. You took the words right out of my month i.e. taking control of our destinies. My blog covers internet marketing, money matters, self-publishing, etc. I haven’t decided on any plugins/platforms just yet, as I plan to reboot course development later on this quarter and into Q3. I had heard about all the changes that Udemy was making and a LOT of people were very upset. As you said though, when you’re hosting your products on someone else’s site we have to go with their rules. Hosting my own scares the crap out of me too I must admit. Knowing that those who make a certain amount in affiliate sales, that I’m responsible for sending them all their tax information and dealing with those out of the US just gives me a headache thinking about it. No way, I don’t even want to mess with all of that so I say hats off to you my dear. By the way, I’ve been using Camtasia for years now and I LOVE this software. Best money I ever spent so for those who don’t really know all it can do, I’m sure they’re really going to benefit from what you can teach them. I agree with you too, you were born to teach. You’re just SO good with showing people how to do things the easy way. Thanks for the report on all that’s going on with these sites and why you chose to go with MemberMouse. I have to admit, I know nothing about all of this stuff….I’m clueless! Have a great rest of your week and I know you’ll rock things Lisa. I’ll be checking back on your blog to see what you’re going to reveal! Have a great rest of the week! The RAINMAKER PLATFORM is worth checking out. I tried the 14 day trial it does podcasts, affiliate software, membership site, online courses and much more all under one platform. I will move there in the summer. although they are planning their own email service I would keep them separate. Been hearing some mixed things about that platform. Some good, some bad. But I think that’s with any platform. That’s good you were able to try it for 14 days. Really looking forward to seeing how this is going to work out for you.Thank you so much for sharing this information on Member Mouse. I’ll have to check it out. I was looking into Member Wish List and tried using it for my first online course had some issues with it so thanks for your feedback on that also. You had every right to be afraid. I build websites for clients everyday. I build custom WordPress sites and I’ve done some pretty advanced stuff, but a membership site is a completely different animal. I used a plugin called OptimizeMember to create a tiered membership section on one of my sites. It worked fine for a while, but then it broke. I thought: no big deal, I have support for help. They gave up after 6 hours, and said I was on my own. I switched plugins and things were up and running again, but it’s still a scary undertaking to create and maintain your own membership site. I am glad to see you tackling it, and I wish you all the luck! It really is and I almost let fear get the best of me but I had to say to myself, sometimes things that are worth it are hard and take more work. But I KNOW in my heart that this is what I should be doing as an entrepreneur. I’ve been out here a long time and I’ve always relied on other platforms for income…even selling courses on Udemy is building up Udemy’s bottom line…. not necessarily mine. It’s time to kick fear in the face and deal with it. Will there be some stumbling blocks? Maybe, but that’s life. You’ll never grow if you just sit back and play it safe all the time. The one comforting thing I have is let’s just say something happens and my members cannot access the videos. Well I can always send them to the Vimeo links for a temporary solution. Worst case. And that’s also why I’m going to hold off on the recurring membership model. I want to just sell one time courses FIRST to get the feel for the plugin. Then slowly migrate to the membership model later. Thank you so much for sharing your story and I’m glad that you are back up and running again! So great to hear from others who are tackling this too. Ohhhh, that’s good to take things in stages. I am not familiar with membership mouse, but I am using Paid Memberships Pro, and it’s really easy to do what you’re wanting to do with that. You could set Vimeo to only show videos for your particular website, and then embed your videos on locked pages. One model I found that works well is a 5-7 day free trial, and then billing them for the 1st month and regularly each additional month. Lisa, if you ever get to that point and need some help, let me know. A 5 minute Skype call could have you up and running. Also, way to go on the quick response! That’s exactly what I plan to do and MM allows me to. So all videos will be set to my domain privacy on Vimeo so no one can lift them and embed them elsewhere. So I will be using the membership plugin to protect pages that the videos are embedded on. I opted not to use an actual course plugin because there may be compatibility issues with certain themes and I am trying to minimize my use of too many plugins. I feel the embed feature will work fine. The plugin is super flexible and even has great upsell shortcode features upon checkout and all kinds of pricing flexibility. I appreciate you sooooooooo much for reaching out to Skype if needed. Great to know there are generous people out here like you. Thank you again! 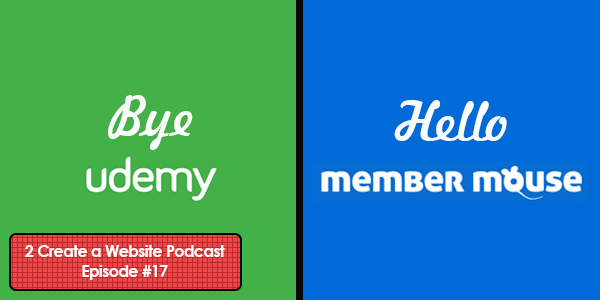 I think membermouse is a very good membership plugin, if I remember it correctly it was featured on a Pat flyn’s podcast where they have asked what is the membership plugin they are using, honestly there are a lot, infusionsoft is one of the popular ones. I have subscribe to a few free udemy courses as well glad they offer free ones too. Oh really? I must’ve missed that one. I have to see if I can find it. I would like to listen to it. I also didn’t know Infusionsoft had a membership plugin. I thought they only did email marketing. Thanks Lindsay! Really looking forward to seeing how this is going to work out for you. Thank you so much for sharing this information on Member Mouse. I’ll have to check it out. I was looking into Member Wish List and tried using it for my first online course had some issues with it so thanks for your feedback on that also. I agree you come across in your online present so sincere and down to earth. You are able to teach some complicated in layman language. I enjoy your videos they are really are informing and engaging at same time. You seem to always know when to change or pull out of something you found out not working for yourself anymore, then you share it with your followers. You give us the pros and cons. There are a lot of people on the internet that charge so much for there knowledge, but are not very good at all. Then you find people like you able to give viable free knowledge away, but able to charge a reasonable prices in order for you to make a living doing what you love for so long. I just admire you and what you have to offer. I feel so incredibly blessed to be able to do what I love for a living, and I’ve always wanted to be a person people can trust. So when I get comments like this, it lets me know that is coming through. I cannot tell you how much I appreciate that, Michelle. Thank you from the bottom of my heart! Yes, It’s important for taking action, some people just been holding to their education a bit too long and very lightly wanting to take action. Thank you for writing this article and doing the podcast Lisa. I really enjoy hearing that people appreciate our dedication to support. We put a lot effort into making sure we do our best to help our customers be successful. Thanks Eric! Looking forward to using and learning more about the product. I was sold on the great reviews online and your plugin has every feature I need. Hopefully I’ll become an affiliate soon! wooo, another name check? So honored! Really looking forward to seeing how this is going to work out for you. Really wish I heard this advice 2 years ago: “I’m not selling the same courses on my site as I am on Udemy.” That would have saved me a whole help of pain. Not to worry though! Loads of good advice in here. And I agree with you, the Udemy change will probably benefit everyone in the long run. I’m always so grateful for your advice. I didn’t mention this in the podcast, but I will be taking the advice you gave about NOT using a course plugin. Since I have Vimeo, I’m just going to protect those pages with Member Mouse. I want to use as few plugins as possible. And I will have some free content that will be behind an email subscription that will hopefully pre-sell the courses. Your advice was invaluable. Thank you! Well Lisa, Interesting as always. I like the idea of you having your own courses on your website, strengthens your web-presence. I was about to build a campaign around your Spreadshirt course…will it be staying on Udemy? Yes, it will definitely be staying on Udemy. All courses on Udemy will remain there. And that is EXACTLY the kinds of courses I would create on Udemy in the future. I’ve learned so much in a year and a half and have a ton of tidbits to share about creating your first course. There’s a lot of things I would change, do differently, etc. But yes, that would certainly be the kind of content that is perfect for a Udemy course. Excellent. I’ll be your first sign-up for that course. I just want to congratulate you on overcoming your fear and DOING IT!!! I really admire all that you do and all the valuable, quality content and information you share. I just want to wish you continued success in all your online and offline endeavors! Thank you Iris! Such a humbling compliment. Thank you, thank you, thank you! Ten years!!! Wow!!! Heyyy there Lisa! Congrats to you for getting things moved over. I talked to James McAllister a little while ago and he told me that Udemy was changing their pricing structure….so good for you for taking the leap! I would loveee to hear more about Member Mouse when you start using it to run your membership site. I am actually on the hunt right now for a great membership plugin for a project that I’m working on. This is good stuff. If you’re not already doing it behind the scenes, I suspect that you’ll soon be taking B-School type training to up your game. You’ve hit the sound barrier of the common masses and appear to be about to break through in a major way. I just love you Lisa, I recommend everyone I know to check you out. I love how you teach it is thorough and easy to understand. My comment is, I have a membership site and I sell a course (a few of them) and the membership platform I am using is Amember. It is REALLY REALLY complicated. I did use Digital Access Pass before and that is doable, but it lacked a lot of features. I want something simpler. I want something I could manage if my assistant took a leave. I can not do Amember it is super and I mean SUPER confusing and complicated and offers very little by way of training. So, I am thrilled to see Member Mouse and I am checking it out. I will let you know what I think too, especially if we actually do the switch. Thanks for what you do. One thing that drew me to MemberMouse is I kept reading how simple it is to use and they have a free trial so you can check it out first. I had heard something about DAP but I can’t remember why I decided against them. Let me know if you should decide to go with Member Mouse. As always I’ll be keeping everyone up to date!! Oh and I forgot to say THANK YOU for telling others about me! Your welcome 🙂 I am going to go with it. I looked into it further and it really looks just what I am looking for! Thanks you so much for sharing. Lisa, I am constantly astounded at the integrity and depth of your posts. If I could follow only one person on the web, I do believe it would be you. I’ve been promoting Udemy to my peeps, and I think I will continue to do so, and I may even use it myself to reach an audience I wouldn’t otherwise have. But on site I am using WishList. I haven’t used it long enough to form a true opinion, but I have hit glitches. If I keep hitting glitches, I may try out MemberMouse. Thank you! If this is not a fabulous compliment, I don’t know what is. Integrity is what I strive for and if you do not have that online, what’s the point of doing anything in business. So thank you, thank you, thank you! You better believe it! Thank you, Randy. Hi Lisa, I have purchased a few products from you off Udemy (thank you so much for the Powtoon one, awesome). Anyway, I was initially thinking of using Udemy for my own online courses but I have a free trial with Kajabi that I’m using at the moment. So we’ll see how that goes. Then last week or so I saw that Udemy was reducing all their courses to no more than $50 and I was like whoa. So I’m glad I didn’t go that route. Also I didn’t want to go that route because some of the students seem to need a lot of hand holding. I don’t mind providing some additional support. However, I’ve created an in-depth step by step course I shouldn’t need to still hold your hand, but that seemed to be the expectation of some students on Udemy. That to me seemed like a lot more work for me as the teacher, and quite honestly a turn-off, especially if they only paid $20 bucks for a $100 course. Lastly Lisa, I have a podcast show that I would love to have you be a special guest on. I’ve actually tried reaching out to you a couple of different times and maybe I’m doing it wrong. I’m not that great at networking. But you’ve changed my life in more ways than one. I bought SBI back in the day because of you. I earn a great passive income as an affiliate marketer because of you and I even bought Studio Press and so much more because of you. Anyway, it would be such an honor for me to be able to interview you. Please let me know if you’d be interested and how we can make that happen. Thank you so much. You probably reached out the right way. I just get behind on email. After I get the courses/member site launched I will be doing more interviews again and I will be honored to take you up on that when I’m done with this chapter and everything is launched! I think that will allow me to discuss more relevant things like launching your first self-hosted product, etc. I think that’s what people should be focusing on now and affiliate marketing, etc. should be secondary. I am so grateful for your support over the years. SBI? Wow! You’ve been following me for soooooooo long. Grateful for long-term followers such as yourself. Great podcast, Lisa! As I was listening, I was going ‘yes’, ‘yes’, and ‘yes’. I have a course on Udemy, and I published it just a few days before the news. I’m not sure what to expect of this change, as I haven’t been on Udemy long enough to understand what the difference for instructors would be. But one thing I agree with you 100% is that I want to have control over my prices, and that’s why I’m also considering using Teachable going forward and building my own platform! I love reading your blog. Keep it up! Teachable sounds like the best approach if you want control without as many limitations. Do you already have a following? If so, even better. The only piece that’s missing with Teachable is the marketplace sales/promotion that may be helpful if you don’t already have a following. Having said that, I DO think the new pricing is going to hurt marketplace sales with Udemy in the short term, but I think for the long-run it’s going to improve the overall perceived value of courses and will eliminate those lazy people creating low quality courses priced at $300 and then discounted at $10. So it will be good for the future. And as I said in the podcast it’s still a great place for people who do not have a following. I have 5 subscribers. My tribe! 🙂 I only launched this new website last week, so I guess it’s a good start. I’m planning to use Udemy mostly for marketing – perhaps publish a few more courses, maybe even for free. If I get any income from them – that would be a bonus. Agree with Larry here – love your writing. You’re being you, mistakes and all. I’m learning a lot from you about how to blog. Thank you! Awesome Nata! Feel free to let me know if you have any questions along the way. I wish you the best! You crack me up with your writing. I know it comes from the heart and maybe that’s why I’m a subscriber. You talk about your wins as well as your losses. Upgrades, too. Thanks so much for sharing. Ha ha ha! Thank you Larry. I do enjoy blogging and it’s so much more fun when you write from the heart instead of trying to be so perfect and polished. Thank you for saying that.